Hello future leaders of the massive creep waves . I’m Sorin Mandache, 2D Artist for The Swarm game and I’m going to discuss today a bit over our pipeline and artistic decisions regarding the monsters in our game. From the beginning we decided that they should be aggressive and alienish. Animal like quadruped or biped anatomy. Mix of skin and bone/chitin plates for protection. So based on the description I started to make sketches.In short time we realized we didn’t want the generic idea of aliens with extremely organic shapes or insect likes, it had to be grounded on Earth somehow and decided to go for something more reptilish. I’m going to try and tell you a bit about our workflow using our most standardized creep as an example. 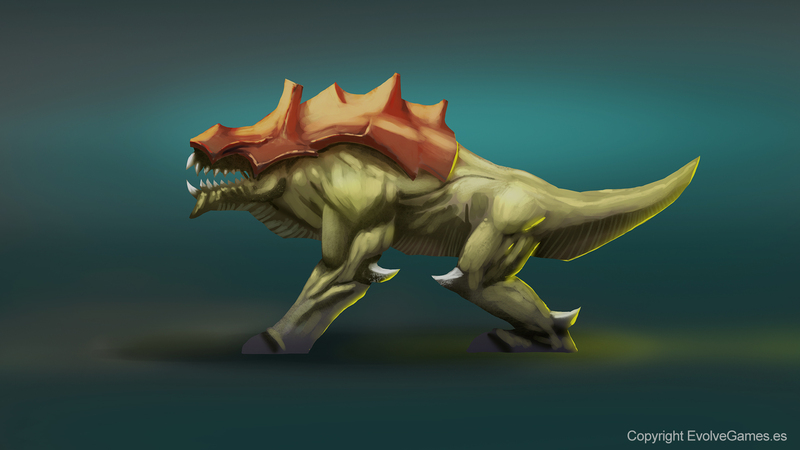 The “Badger” is the most balanced creep inside its tier regarding attack power, movement and defense attributes.It possess solid legs and arms with sharp claws and very big horns on each side of his lower mandible that would pierce the human flesh like a hot knife through butter. BTW we’d love you to help us choose a suitable name for this specific creep! Don’t forget there will be other badass and bigger creeps though. [Leave us a comment below]. In order to find the ideal look I started working on different styles to see which one worked better. The first one was pretty organic, with too much details and really defined shapes, which would have created a lot of noise taking on count the game top down view and the scale of the units. Then I tried a more simplified style emphasizing its arms and weapons but it looked too simple and those arms and legs pointing to the sides gave it an unrealistic look. So next step was trying with an average between the first two iterations, not too detailed, not to simple. Finally after many iterations for the main body shape, we started to get an idea and began iterating with some details which will later define the unit role. I usually try quick sketches from other perspectives so both me and the game designer can get a better idea of it. We tried several heads (cause it was gonna be this unit’s “weapon”), and plating configurations until we finally found a design that will dictate the look of future creeps. 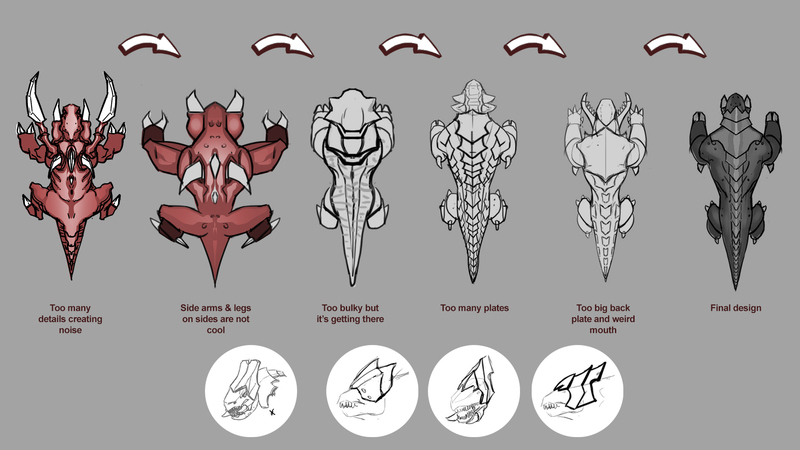 For other more specialized creeps we’ve started sketching and giving each one a unique silhouette, that would be recognizable from above, as well as giving them a unique appeal in accord to their specialty. Once we had some distinctive designs and silhouettes we had to solve another issue: Size. We had to establish different sizes for each creep inside their own tier but also increase exponentially the size of the creeps in the higher Tiers. Not only the designs had to undergo major changes but also the color of this race which is very important to identifying it. 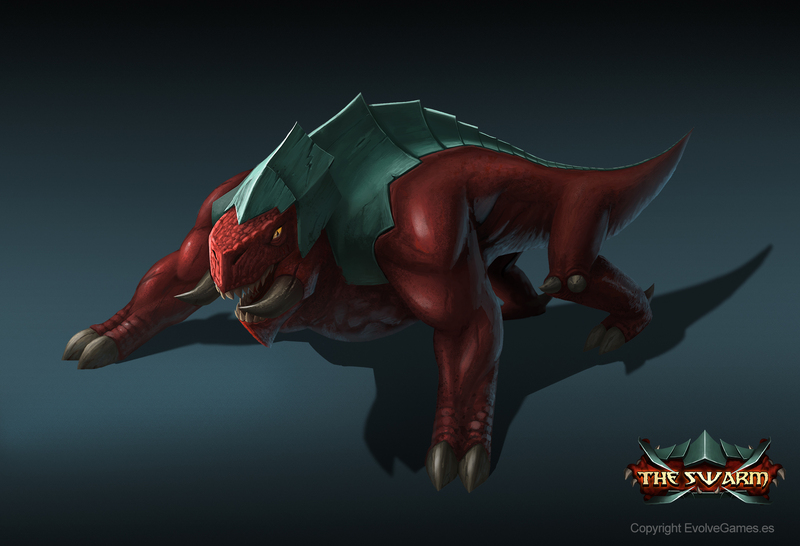 Initially the race, being based on reptiles, had green skin and its complementary color, red, for the plates. But due to their size and the fact this game is based on Earth they were difficult to spot on the green grassy areas and we felt this colors didn’t even fit with the creeps purpose which is the humanity annihilation. After testing basically all the color spectrum we settled on a demonic combination perfect for their inborn evilness.Dry bloody red for the skin and turquoise for the plates. When ingame the shades of color will vary depending on their size which will give them even more visibility. This is the time when after searching for the best design I sketch out a semi-profile of the creep in order to see it in all its splendor which can’t be seen from top-down and through many hours of work I bring it to life in a beautiful illustration.You better like it or it will bite. All these steps are a combination of creativity, effort, lots of trial and error and communication from both the artist and the game designer. I really hope you enjoyed this short introduction into our art pipeline and that you liked these concepts.Don’t forget to let us know in the comments what name would you give to the “Badger”. We’re looking forward to hear your suggestions and questions regarding the game design, art and development.